There’s a reason that hops are used to bitter basically all beers. They deliver a high amount of bitterness (primarily in the form of iso-alpha acids) per unit of plant material and have a wonderful aroma. Both these characters have been artificially selected for at least a couple centuries. If you attempt to brew a beer bittered with something other than hops, you will almost certainly need to add more plant material to get an equivalent amount of bitterness. This will result in higher levels of astringency in these beers. And, the aroma of the plant will likely not be as well suited to beer as hops are. One way to brew a heather ale would be to take any Scottish ale — from a Scottish 60/- to a wee heavy — and add a bit of heather to the formulation. Scottish ales are not highly bitter, so even if the heather contributes almost no bitterness, you can still enjoy the aroma of heather in the beer and let the hops supply the bitterness. 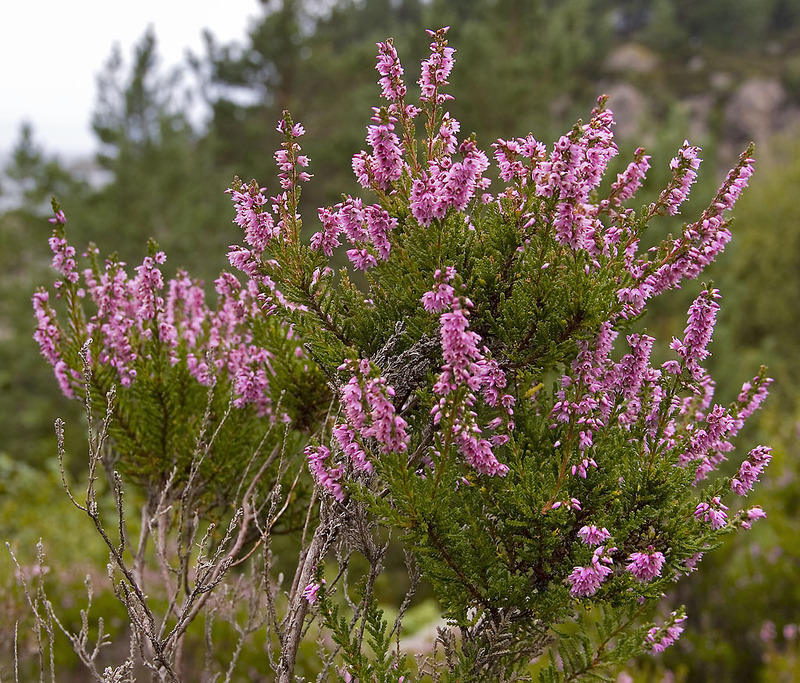 The part of the heather bush used in brewing is the growing tips. These have young, tender leaves and the flowers. They will also contain a stem. Dried heather is easy to find online, as are heather tips with the stems removed. If you include the stem material in your brewing, you may get a hint of tannic astringency. At low levels, this is not necessarily a bad thing, especially in higher-gravity beers. In excess, it makes the beer unpleasant to drink. There are at least a couple ways to brew with heather. One is to use the heather as you would hops — add it to the kettle during the boil. The second is to make heather tea and blend it into the finished beer. If you are using heather in the same manner as hops, here’s one way to do so with a high percentage chance of success. Brew any Scottish ale as you normally would, but use only 80%–95% of the hops you normally would. To make up the remaining bitterness, add dried heather tips as if they contained 0.50–1.0% alpha acids. (They don’t, this is just a way to try to estimate their contribution to bitterness.) If the total amount of dried heather exceeds 4.0 oz. (110 g) per 5.0 gallons (19 L) of beer, be aware that you might be adding some noticeable astringency. You can also add heather tips at the end of the boil for their aroma. Smell the heather and gauge its intensity versus a similar amount of hops. Then, use this as guide for how much you add. It will likely be more than the usual amount of late hops you’d add in a Scottish ale (which is sometimes zero), so don’t overdo it. This method is very simple, but the results are likely to depend on the bitterness and aromatic qualities of the heather, which is likely to vary quite a bit. A second way to brew with heather is to make a strong heather tea, and blend it with your finished beer. You can do this a number of ways. You can make the tea with hot water, or you can make an alcohol extract with vodka or Everclear. The simplest way, though, may be to make the tea using the beer you are going to spice with heather. To do that, brew your hopped beer as you normally would. Then, fill a sanitized, sealable jar with the heather you plan to use. Ideally the jar should contain roughly one half heather and one half empty space. This will allow the dried heather to expand, and still leave you with some tea to work with. Pour the beer into the jar, seal it, and store it in your fridge for about a week. Fill the jar all the way to the rim, so as little air as possible is sealed inside. It is easier to do this with uncarbonated beer, as carbonated beer will foam when poured over the heather. Once the heather tea is ready, blend it with your beer. Since the tea was made from beer, it won’t dilute your beer. Also, since it contains both water and alcohol, it will contain both water soluble molecules from the heather, and a small amount of alcohol soluble compounds. If you want, you could make a small test blend to test the strength of your tea and use that as a blending guide. To increase your yield of tea, you can pour the contents of the tea jar into a French press and compact the heather bits, yielding more liquid tea. Hops are the king of beer bittering agents for a reason. However, this shouldn’t stop you from experimenting with heather as a supplement to them. And remember, you can also brew a Scottish ale as you normally would — with no adjustments of the hop amounts — and use heather tea to spike only part of the batch. That way you’ll have “regular” Scottish ale and a bit of heathered Scottish ale as well. Since Scottish ales aren’t particularly bitter to begin with, it won’t matter much that the blended ale is slightly more bitter.